The radar showed a relentless wave of squalls lined up and headed our way… some people (many people!) would say we were crazy to even entertain such an idea. My own brain said the same thing… (“What? Go out in this weather? Are you crazy???). We bobbed around in the not knowing, between logic and inspiration, for maybe twenty minutes. It seemed foolish, even risky, to leave this warm apartment and go out into the wet weather, but adventure was calling just as loud. I don’t know what it was that tipped the scale, but we both finally agreed – let’s do it! 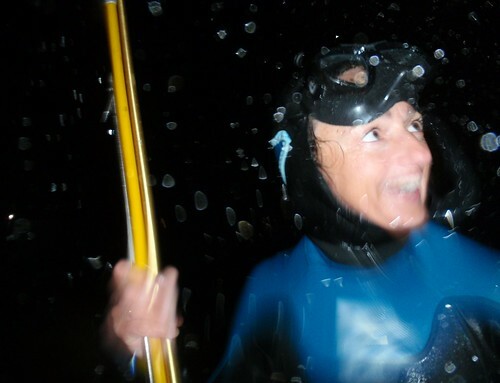 We put on our wetsuits, grabbed our gear and walked to the boat in the rain, grinning from ear to ear. It didn’t matter what happened next, or if we’d have to turn back from rough seas, for we were wet, committed and having fun. I bailed out multiple buckets of rainwater from the boat while she topped off the inflatable tubes with the foot pump. We loaded the gear, fired up the motor and sped off into the blue, laughing with excitement, feeling like two kids playing hooky from school. The surf was fine, the swells out on the water were small. The water was cold, green and muddy from all the rain. Our first stop was a sunken barge in 40 feet of water, I’d spotted a big grouper there a few days ago, and schools of yellow and bar jacks frequently cruise past the wreck in search of their own meal. We dropped anchor and got in the water. It was colder than expected, hard to see clearly from all the rainwater mixing in with the sea, but I saw a jack swimming upcurrent towards us. I dove down to meet him, and as soon as I got ten feet below the surface, the water got warm and clear… it was beautiful! I speared the jack (yeay, fresh fish tonight!) and after a bit we moved to the next spot, happy as seals for our time in the sea. We didn’t see a single boat out there; we had the entire ocean to ourselves. Over the next few hours we got three fish; the jack, an ocean tully, a grouper and one big lobster. We were late getting in, just behind sunset, and brought our catch up to the WildQuest family for dinner. The fresh fish was lovingly received. We filleted them on the dock, they went into the oven, and we brought the boat home in the dark. 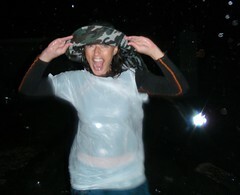 I got a bit of scolding from my Bahamian friends for coming in after dark, particularly in such intense weather. “Next time don’t bring the girl out into the storm with you!” they said, not knowing the only way I could have gotten Jwala to stay ashore is with lots of rope and chain. Exhilarated – a great word to describe the energy in my body and spirit… Being out in the elements in all their passion fired up our own, and after the most incredible hot shower we sat down to a community dinner of fresh caught fish with dear friends. I’m so glad we went fishing, we almost didn’t. In moments of uncertainty, when the yes and the no collide, what do I do? Ultimately, the passion to join with the sea in her tempest was stronger than the mind, and once we said yes and were committed I knew it was the fun/highest/best choice. By being willing to hang out in the not knowing, free of the need to force a decision, it sorted itself out until the action wasn’t even a choice, it happened of itself. But was it safe? (The perennial question)… To the mind, certainly not. Prudence would have us stay ashore (and stay warm and dry!). But life is both eternal and fleeting, and the call of the sea and the wind had a grip that was undeniable, and our yes to her beckoning evokes waves of exuberance that I’m feeling still in the remembering. We all know that voice, it calls us each day to follow our hearts regardless the voice of the mind, fear, conventionality. Yes I am crazy, happily so! Previous post: Is there ALWAYS a simple solution? Next post: Christmas in Bimini!